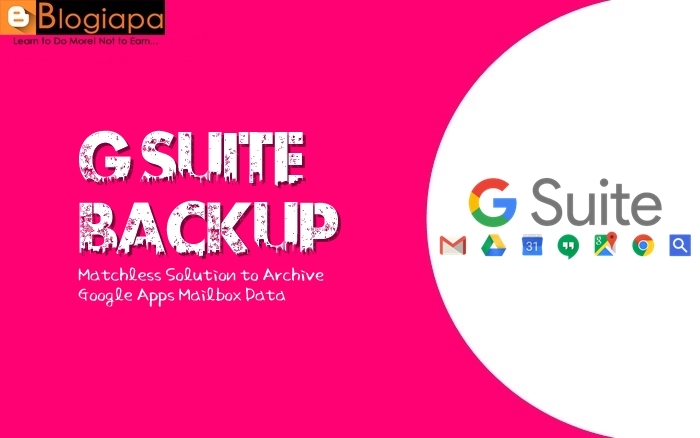 In order to protect users data from any failure, we recommend using SysTools G Suite Backup Email tool as this is one of the safest ways to export complete mailbox data to multiple file formats. For many organizations and users, Google Apps is such an integral part of their workflow and any kind of data loss can be a business-killer. Over 50% of data loss issues are caused by end-user mistakes. Accidental data deletion, hacker attack, corruption, ransomware viruses etc., are some most common factors that may result in data loss. Losing crucial information is stressful and economically challenging. In order to protect your confidential emails, sheets, documents, and other files from being permanently deleted, there is no better option than Google Apps Mailbox Backup. This does not mean that your data is not being safe on Google’s servers yet, it is about protecting against malware, sabotage, hardware malfunctions, and system crashes that can get synced up with the cloud. The software is capable to archive emails, contacts, calendars, and documents from a Google Apps account. Its quick working speed and simple Graphical User Interface makes it unique from other third-party applications. We hope you to share our blog with your friends/colleagues. You can also get us on Facebook & Twitter. The software allows users to download and copy entire data items of G Suite account such as emails, contacts, calendars, documents etc., on the local system, computer/desktop. It exports data items in their respective and most common file formats i.e., EML, PST, VCF, ICS etc. Also save data with associated metadata properties such as To, From, Cc, Bcc, house address, email address, calendar recurrences, groups, meeting alerts etc. EML: Supported in Windows Live Mail, Windows Mail, Outlook Express etc. MBOX: Exportable to Mozilla Thunderbird, Entourage, Apple Mail, Eudora etc. After opening downloaded/archived emails via any of the supported email clients, it will display all the options such as Reply, Reply All, Forward etc. Apart from emails and attachments, users also can export all Google Apps/G Suite for Education or Business/Non-Profit account Contacts and Calendars via SysTools G Suite Backup tool. It archive data into widely used file formats such as vCard (.vcf) and .ics. vCard: Compatible with multiple devices and applications such as MS Outlook, Smartphones, iPhone etc. Users are allowed to archive last modified or the latest revision of Google Apps documents such as documents, spreadsheets, drawing, presentations etc., into MS Office supported file formats. The software will export/copy Spreadsheets as .xls format, documents as .doc, drawings as .jpeg, presentations as .ppt etc. Also, it maintains the original formatting of each document. Single User Account Archive: For this, users need to enter the username and password of an individual user mailbox to save Google Apps mailbox to desktop/hard drive/laptop. Domain User Backup: Users just need to provide the Admin credentials to export bulk /multiple user accounts of a single domain of G Suite. During the Google Apps email archiving, users can set a particular date range to save the data. This allows to copy/move emails of a specific time interval. Users just need to set a specific date range of “From” to “To” and the tool will export all the emails of that particular date range. Via this, users can selectively export the emails from Google Apps to Outlook PST, MSG, EML, and MBOX format. If user’s Cloud data storage limit has been extended and they need to empty the space via archiving the entire data then, the software provides “Delete After Download” option. One can archive and delete the G Apps data files from the server. Demo Version: Users can download the demo version of the tool from the official website of the company. This will help you in understanding the complete working of the software in a much better way before purchasing it. As it is totally free of cost thus, it has some limitations over the licensed version but it gives a complete understanding of the tool. Full/Licensed Version: Once the user has a complete understanding of the Google Apps Backup tool and satisfied with its working then, you can order its licensed version to backup Google Apps data. This version will provide you complete access to the software even without any limitation. After analyzing the functionality, performance, working speed, and features, we would like to rate the SysTools G Suite Backup Software 9.8 out of 10. All users who are required to archive their G Suite data locally in multiple file formats must utilize this amazing utility.